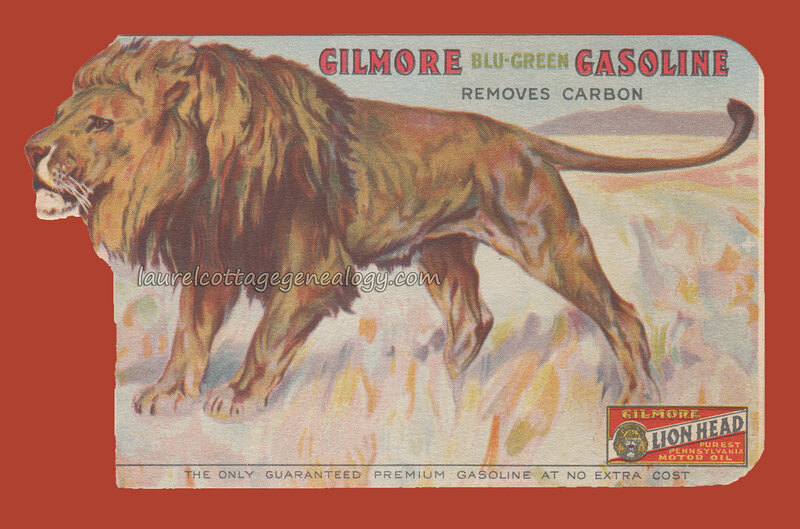 Not being raised on the West Coast, and not being a collector of petroliana, I had never heard of Gilmore Oil until researching this trade card, (or possibly had but hadn’t payed enough attention) but have since discovered a lot of fascinating information. 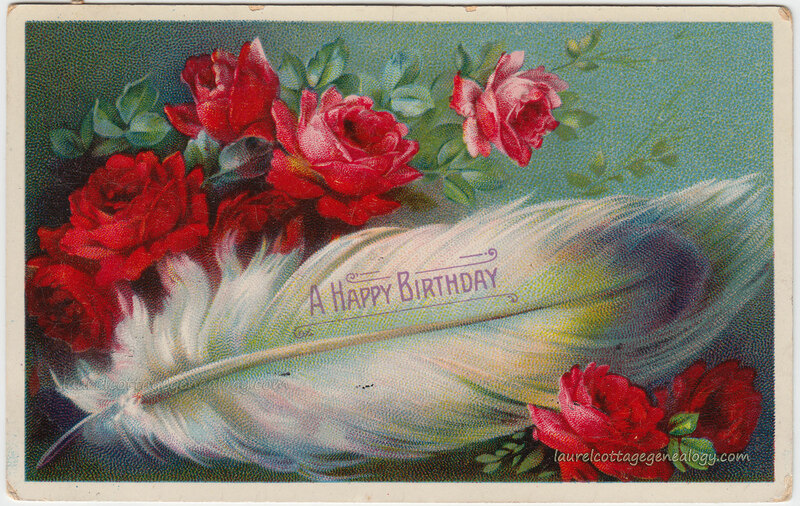 I am just including some things here that I’ve learned from other websites, to go along with this trade card post. The Gilmore Oil Company was based out of Los Angeles, California, and started by Arthur Fremont Gilmore. A.F. Gilmore owned and operated a 256-acre farm, near the La Brea Tar Pits and found oil (that makes sense) while drilling for more water for his dairy herd. A.F.’s son, E.B. (Earl Bell) joined his father, and became chief executive of the company, and a master at promoting and marketing. The company, among other things, sponsored race cars, airplanes, boats, motorcycles, had it’s own sort of traveling circus, a radio show, and a lion cub mascot named “Gilmore” who flew thousands of miles as “co-pilot” in a company plane. The pilot was Roscoe Turner (lots already written about Roscoe and Gilmore, the cub. See below for sources.) And Gilmore Oil was highly successful. According to the Farmer’s Market website (www.farmersmarketla.org) ” A.F. Gilmore and his son, Earl Bell (E.B.) turned their Gilmore Oil Company into the largest distributor of petroleum products in the Western U.S.” Why does a farmer’s market website have facts about an oil company? Because the Gilmore land that was once dairy farm, then oil field, eventually became the site of a farmer’s market, and that is another whole story. More interesting stuff: Gilmore the cub logged over 25,000 air miles, and is said to have been the inspiration for MGM’s “Leo” the lion. E.B. Gilmore is said to have been the first to offer a self-service gas station. 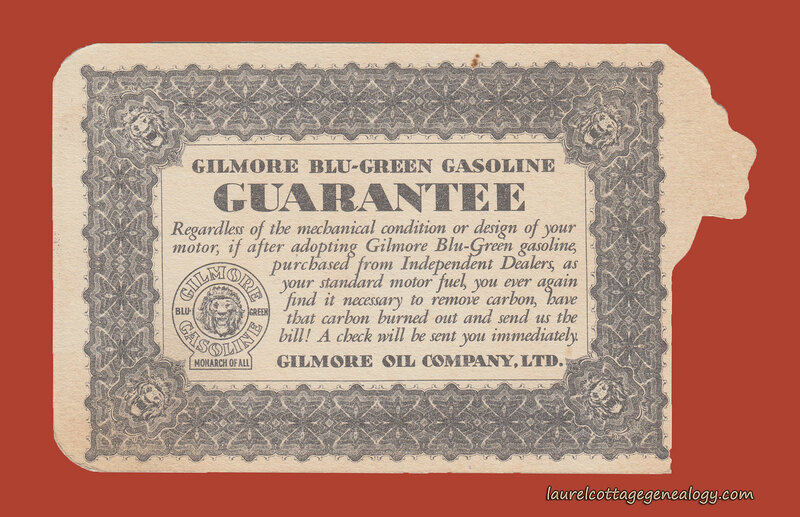 And the company’s radio show called “The Gilmore Circus” featured “Blu-Green, the longest song in the world.” It was advertised as such since every week, a new verse on the excellence of Blu-Green gasoline was added, chosen from hundreds? that had been submitted by the public. Winners were awarded weekly and monthly prizes. Real Photo Postcard of unknown pioneer-type woman. The pose of this woman reminds me of a character in a play or a book. I thought at first I would turn the card over to the other side and see something about a re-enactment. It reminds me of the book Shepherd Of The Hills by Harold Bell Wright, which I read when about eleven years old, although why it should remind me of this book is unclear to me, as I don’t even remember all of the book’s characters. 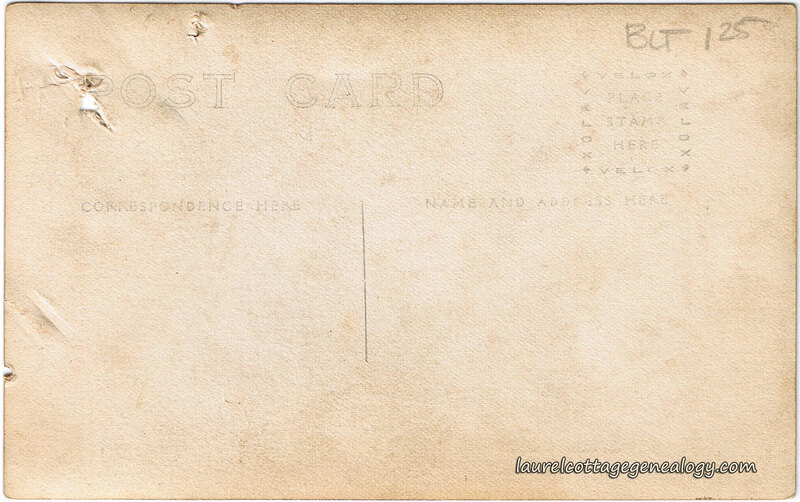 But, as you can see, there is no such explanation on the back, and nothing to indicate where this postcard came from. It was found in an antique store in California. I’m assuming it was taken somewhere in the United States, but don’t really know. Whoever this woman is though, she certainly looks proud and strong. 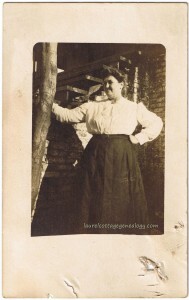 She is standing in front of a building that has some brickwork and a rather tall set of wooden stairs. Was this her home, a relative’s home? Are we looking at the back of an old general store, or someplace she visited while on vacation? We could think of a million stories for her. And what was up with the really tall set of stairs? Was the building built on the side of hill? Update: Here’s a postcard of Old Matt’s Cabin, which I came across later, and just posted. 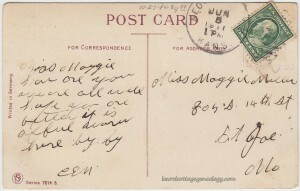 There’s no connection between the two postcards, except for the memory it triggered for me. But not surprisingly, yesterday (at my regular customer service job) I happened to talk to someone from Branson, Missouri. This synchronicity type of thing happens a lot. Heck, maybe this woman here is from Missouri. You never know! Divided back, unused Real Photo Postcard. Velox stamp box, circa 1907 – 1917. 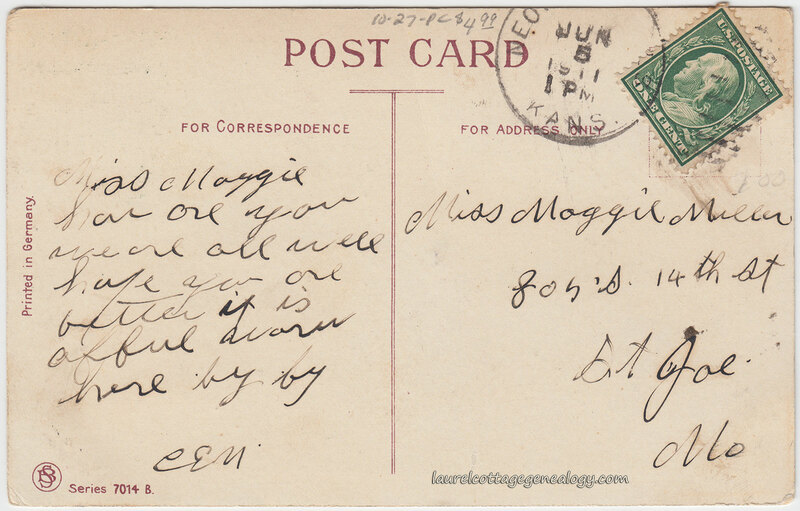 I think of this postcard as “The Livernois” but obviously according to the back of the card the subject matter is Fabrique St. in the city of Québec, Canada and “the cathedral.” It is unusual I think, to have the cathedral unnamed in the description on the back of the card. A little research clarified that this is the Basilique-Cathédrale Notre-Dame de Québec. It is the building just to the left of the clock tower building. You can see the cross topping the rounded cathedral tower. As stated in the description, the original foundation was built in 1647. The cathedral was destroyed two times, ravaged in the British bombardment of the siege of Québec, and by a fire in 1922. The second restoration was completed in 1930, the cathedral was classified as a historic building in 1966 and listed on Canada’s national register in 1989. As to the “Livernois” it appears to have been a drugstore. 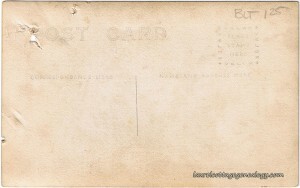 The date of the postcard is unknown, but perhaps from the 1930’s. Published by Michel Photo, Montréal, Canada. P2717. Plastichrome by Colourpicture. Divided back. Printed in the United States. Beautiful apples. 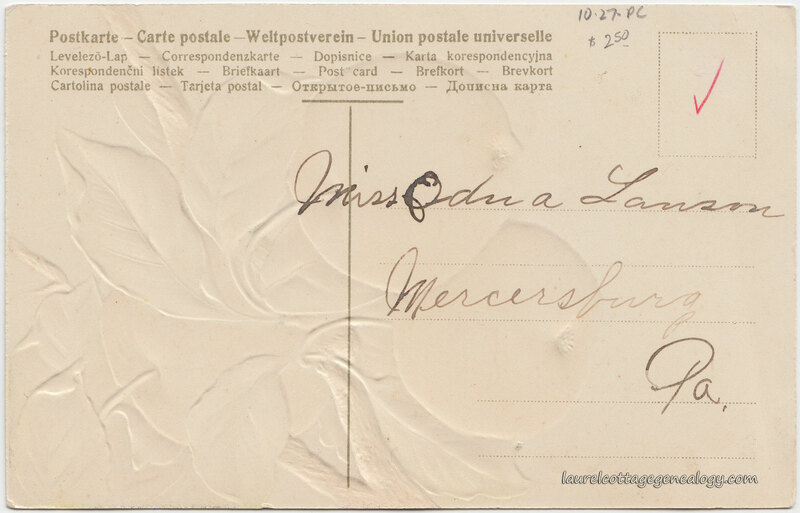 Most likely a German postcard due to the first word for postcard “postkarte” being in German. Embossed, divided back. Front writing from sender says “your sincere friend, ans [answer] soon. Ruth. 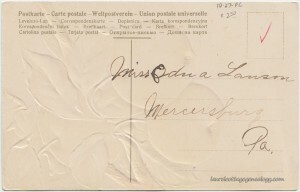 Good Bye.” Addressed to: Miss Edna Lanson, Mercersburg, PA. Cabinet Card, circa 1880s. Charles A. Millard photography studio, Detroit, Michigan. A beautiful but seemingly sad Detroit girl. Why the sad look? And we wonder what her ethnic background was. Too bad there is no identifying information on the card for the young lady. 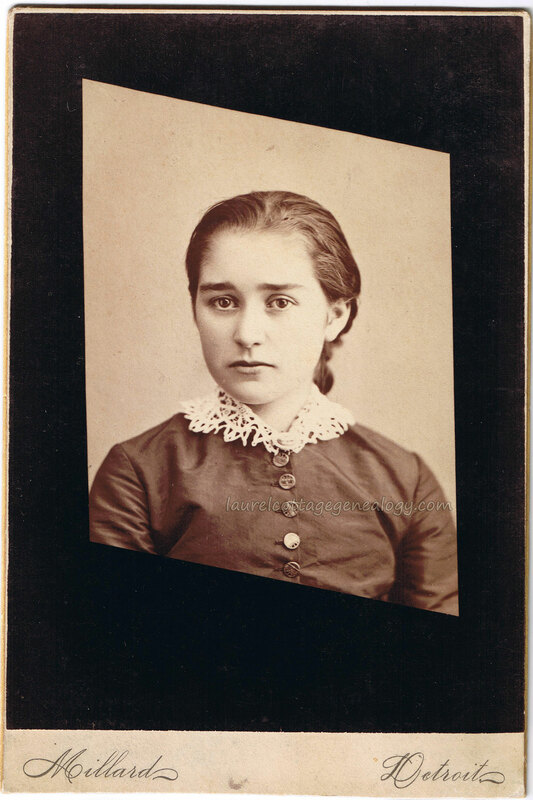 But it’s a wonderful portrait from the Charles A. Millard studio, guessing from the 1880s. Charles A. Millard teamed up with Benjamin F. Powelson, and in around 1879 or 1880, Millard bought out Powelson. Besides artistic photography, Millard’s studio also offered portraits in pastels, India Ink, oil and watercolors. For more information on Charles A. Millard see the prior post.